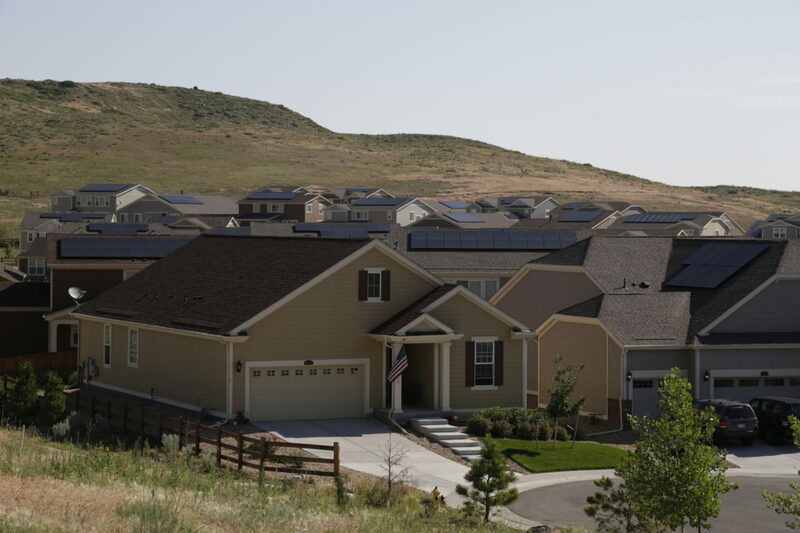 Developers of the Table Rock Ridge Subdivision outside Golden, CO require all homes be sold with rooftop solar panels already installed. Solar energy has had a great decade. One estimate puts the industry’s growth at 1600-percent over the last eight years. However, this past year has not been so good, especially for rooftop solar companies. The market for residential solar systems has taken a hit, resulting in the bankruptcies of companies such as SunEdison, Sungevity, Suniva, and at least one company not starting with “sun” — SolarWorld. Nancy Kaatz moved to the stately Table Rock Ridge Subdivision near Golden, CO about a year ago. The developer required every house built in the subdivision have solar panels. Residents choose whether to buy the panels outright or enter into a leasing agreement with company SunStreet. Kaatz decided to lease the panels, and she’s OK with the requirement. “Our energy bills are really cheap compared to California,” she said. That’s one of the core arguments for buying a rooftop solar system — save the planet and save money too. Kaatz gets two power bills each month through her leasing arrangement. One from SunStreet, where she pays for electricity at a 20-percent discount. Then, she gets another bill from utility Xcel Energy for the power her panels were not able to produce. For those who decide to buy the panels, all of the power their panels generate is free. Then, through Colorado’s “net-metering” policy, whatever power the owner doesn’t use they get to sell back to the utility. Most states have some form of net-metering. Recently, however, there have been challenges to this net-metering system, which critics claim is a subsidy for solar owners. In Arizona, Maine, Hawaii and most recently Indiana, utility commissioners and state legislators have rolled back or reduced these net-metering programs. Ashley Brown of Harvard University’s Electricity Policy Group said net-metering is usually far too generous. “It pays a premium price well above market and substantially above costs,” he said. Brown stressed utilities have a lot of fixed costs. Every time a solar customer buys less power, the utility has to shift the burden of those fixed costs onto other, often poorer customers. Brown called it a kind of “Robin Hood in reverse.” He said net-metering laws were put in place to lure customers when solar panels were much more expensive. Now, consumers benefit from bargain-basement Chinese panels flooding the market. Despite those rapidly falling prices, Bloomberg New Energy Finance still predicts a two-percent drop in rooftop installations this year. That might not sound like much, but the industry has been used to an average annual growth rate of 68-percent over the last decade. Solar entrepreneur and president of Generate Capital Jigar Shah does not point to the rollback of net metering policies to explain the downturn. After all, other states are doing the opposite. For instance, Nevada just re-instated its net-metering program. “More markets are open today than have ever been open before,” he said. Rather, he said many companies expanded too quickly, spending far too much on things like television marketing and billboards. Those companies are now scaling that back. There’s also been a market saturation of sorts in California — solar’s biggest state. But, Shah remains bullish and expects the 2017 solar downturn to be a temporary blip. He thinks companies will adjust their marketing strategies and start growing again next year. Regardless of how roof-top solar is sold, Ashley Brown from Harvard said if the US really wants to seriously address climate change, there needs to be a change of thinking. “By far, the least cost-effective way of reducing carbon in our environment is rooftop solar,” he said, preferring large, utility scale solar projects and wind farms. Back at Table Rock Ridge, resident Nancy Kaatz said having panels on her roof just makes her feel good, as long as they’re not too obvious. “I wouldn’t like it if I walked outside and saw these big panels in front of my house and it took away from the look,” she said. Dan Boyce has been filling in for Marketplace Sustainability Reporter Scott Tong this June and July. You can listen to his coverage here. Rachel Waldholz of Alaska’s Energy Desk recently filed this story for us on the opportunities for solar entrepreneurship in the Last Frontier. As solar energy matures as an industry, it’s gaining stakeholders across the political spectrum, such as the Conservative Alliance for Solar Energy (CASE) in Arizona.